Ramakrishna was one of the most remarkable Indian saints of recent history (1836 – 1886). 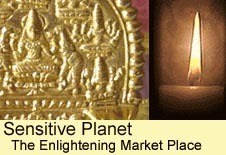 He is chiefly known for his high attainments in approaching God along many different paths. Most saints have one path, one line of attainment in reaching the goal. He explored each in its turn. He was a lively and likable human and made a deep impression on all that came into his sphere. He left behind innumerable devotees and helped many to follow the ultimate goal in his footsteps. One of his most noteworthy devotees was Vivekananda who eventually made his way to America where he helped to form a bridge between Eastern and Western thought and culture. The offshoot of Vivekananda’s teachings on Vedanta are still being propagated today by the Vedanta Society of Southern California. Ramakrishna was a highly unorthodox and controversial figure in his time. He did everything straight from the heart and with great enthusiasm. He wasted no time or energy on earthly pursuits but showered all his love and energy on the Divine in the various roles that were cast in his life. As a young man he was given the job of priest in a Kali temple to carry out the daily rites conferred on the statue of the Divine Mother. 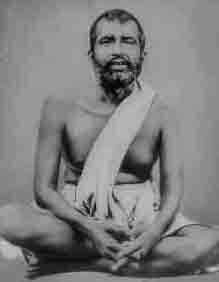 To Ramakrishna it was not a statue but the Mother herself and he carried out all the prescribed rites with full devotion and love for the Mother and an intense longing for a vision of her real form. 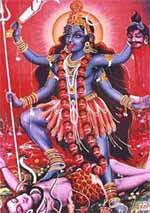 His attachment grew to the Mother Kali behind the stone form and he more and more desired to directly see what he knew to be the living presence depicted in the statue. I was then suffering from excruciating pain because I had not been blessed with a vision of the mother. I felt as if my heart were being squeezed like a wet towel. I was overpowered by a fear that it might not be my lot to realize Her in this life. 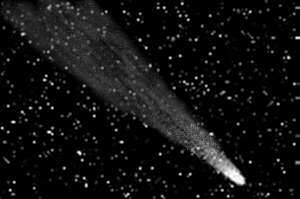 I could not bear the separation any longer: life did not seem worth living. Suddenly my eyes fell on the sword that was kept in the Mother’s temple. Determined to put an end to my life, I jumped up like a madman and seized it, when suddenly the Mother revealed herself to me, and I fell unconscious on the floor. What happened after that externally or how that day or the next passed , I do not know, but within me there was a steady flow of undiluted bliss altogether new, and I felt the presence of the Divine Mother. The buildings with their different parts, the temple, and all vanished from my sight, leaving no trace whatsoever, and in their stead was a limitless, infinite, effulgent ocean of Consciousness or Spirit.